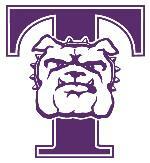 The Big Event, an annual day of volunteer service for Truman students in the Kirksville community, is scheduled 9 a.m.-2 p.m. March 17. That day, hundreds of Truman students will provide services to the residents of the community such as raking leaves, washing windows, painting and more. The Big Event, coordinated through the University’s SERVE Center, gives Truman students the opportunity to show appreciation for all of the support the Kirksville community has offered them. Last year 1,400 students donated their time. This will be the 11th annual Big Event. All students and student groups are invited to volunteer at one or more sites in the Kirksville area and all tasks are safe and do not require the use of power tools. The SERVE Center coordinates the materials with the host, so volunteers need not bring any. Participants will be able to buy T-shirts or donate directly to Big Event. Their support allows the SERVE Center to continue serving the community through the annual Big Event. Likewise, all community members and organizations are able to register to host a volunteer project through the SERVE Center. Student registration is open now through March 2. For registration and waiver form, visit serve.truman.edu/bigevent/, email serve@truman.edu or call the SERVE Center at 785.7222. IRS-certified students at Truman are volunteering their time to help individuals with low- to moderate-income levels file their simple tax returns for free. Students and members of the Kirksville community can get help from 8 a.m.-3 p.m. Feb. 25, March 24 and March 31 in Violette Hall 1424. Truman’s chapter of Beta Alpha Psi, an organization for financial information professionals, adopted Volunteer Income Tax Assistance (VITA) 11 years ago. VITA is a national program established by the IRS that provides tax return assistance. Each year, 300 Truman students and members of the community seek VITA’s help. Members of Beta Alpha Psi help an area resident file her taxes during a recent VITA workshop. The sessions are designed to help members of the community file their simple returns for free. Lucas Dille, vice president of VITA for Beta Alpha Psi, believes this assistance program is a great opportunity for all students interested in accounting or finance. “Students participate because of the hands-on experience of preparing tax returns and working with clients,” Dille said. Alan Davis, associate professor of accounting and the VITA advisor, assists with all training and is present on filing days. Training consists of several sessions informing volunteers about the U.S. tax system. Volunteers must also complete several practice returns and take an IRS qualification test. This year, 150 Beta Alpha Psi members and other workers are volunteering on campus. For more information, visit bap.truman.edu or email Lucas Dille at lmd6224@truman.edu. The Truman men’s cross country team posted the highest cumulative grade point average among 80 Division II institutions and earned the distinction of being a United States Track & Field and Cross Country Coaches Association All-Academic Team. In addition, senior Joey Walls was one of 208 runners to earn All-Academic individual accolades. Truman reported the highest cumulative team GPA among men’s Division II squads with a 3.71 while Gannon University in Pennsylvania was next at 3.60. To qualify as a USTFCCCA All-Academic cross country team, the team must have a cumulative team GPA of 3.00 or better and have complied a score (finished at least five runners) at their respective NCAA regional championship. Walls, native of Columbia, Mo., and graduate of Hickman High School, finished seventh out of 145 runners at the South Central regional in November and, coupled with his GPA, was named USTFCCCA All-Academic for the second straight year. A 3.25 GPA and either a top 50 percent finish in the NCAA Division II National Championship or a top 30 percent finish in the regional competition is required to earn All-Academic honors. Lunch-n-Learn, a weekly lunchtime technology workshop designed for faculty to incorporate new technology in the classroom, begins Feb. 22. The Learning Technologies Team will sponsor sessions from 11:30 a.m.-12:30 p.m. on Wednesdays in Pickler Memorial Library 103. To register to attend any or all of the sessions, visit eventmanager.truman.edu. Session one will focus on Skype Feb. 22 and how it can be used in education to bring guest lecturers into the classroom and for online courses. Session two, Feb. 29, will focus on the use of Panopto in online, blended and face-to-face classes. Discover how adding brief introductory videos can enhance learning and build trust with students online. Session three, on March 14, will discuss the use of VoiceThread to take online discussions to a new level of interactivity. Session four will focus on GoogleApps March 28. In particular, it will discuss the two GoogleApps used at Truman: Google Docs and Google Sites. Learn how wikis like Google Docs can be used to facilitate deeper learning. Spend time creating a website using Google Sites that can be shared with students. Session five, April 4, will educate on a variety of free resources used to engage students, such as TED Lectures, Merlot, Connexions, Ning, MIT OpenCourseWare and more. Session six will focus on Films on Demand April 11. Films on Demand is a service offered by the library with digital video selections that can enhance coursework. Session eight will discuss fun and free tools for use in education April 25. It will focus on Prezi to amp up presentations, Digg and Delicious to keep websites organized and StumpleUpon to stay abreast on favorite topics. The International Student Affairs Office is now hiring for the 2012-2013 academic year. Available positions include cultural integration leader coordinator, cultural integration leaders, academic success mentors and office assistants. The cultural integration leader coordinator helps facilitate International Student Orientation, plans and executes cultural and social events, staff training and evaluation, and weekly meetings to keep communication open between the professional staff and cultural integration leaders. Cultural integration leaders are student workers who live in the residence halls and use their scholarship or work-study hours to assist international students adjust to an American university and culture. Academic success mentors assist international students in adjusting to the academic rigors of Truman by meeting individually with students on a weekly basis. Office assistants provide effective support in the daily operations of the International Student Affairs Office through receptionist duties, answering questions and providing welcoming service to all international students. Details on each position can be found on TruPositions. Applications are available in Kirk Building 120 and are due by 5 p.m. March 2. 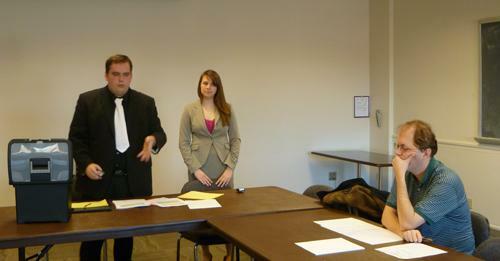 Kristen Wright (middle) from Truman debates opponent John Bower (left) from Crowder College for judge Matt Doggett (right) at the Missouri Association of Forensic Activities State Tournament Feb. 17. Competitors from all over Missouri and surrounding states competed in various events to win state titles and other awards. Two squads from Truman’s Mock Trial Team competed at the 2012 Kansas City Regional Tournament hosted by UMKC as part of the American Mock Trial Association Feb. 11-12. Peter Bruntrager, a senior mathematics major, won the individual award for Outstanding Attorney. Nasra Aaden, a sophomore justice systems major; Samantha Simms, a junior business administration major; and Ann Frydrych, a junior justice systems major, won individual awards for Outstanding Witness. One squad placed 6th out of 24 teams and is invited to compete at the opening round of the National Championships in St. Louis in March. 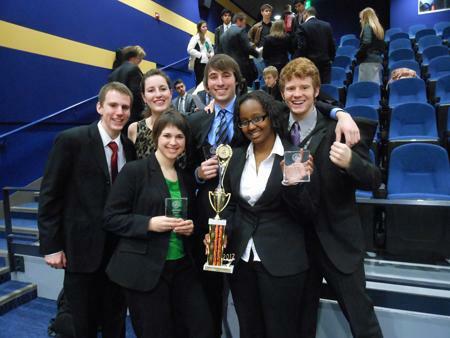 Members of Truman’s Mock Trial team celebrate after the 2012 Kansas City Regional Tournament. Pictured, back row, left to right: John Brooks, Audrey Rabenberg, Peter Bruntrager and Caleb Reed. Front row, left to right: Sam Simms and Nasra Aaden. The 2012-2013 Free Application for Federal Student Aid (FAFSA) is now available at www.fafsa.gov. It is important to apply before April 1 to be considered for all available funding. The government allows filing with estimates in order to meet early state or institutional deadlines. The FAFSA is also required for Parent (PLUS) Loans. Contact the Financial Aid Office in McClain Hall 103, or call 785.4130 with any questions. Approximately $250,000 will be awarded to current Truman students for the 2012-2013 academic year. Applications are available online and are due by midnight March 14. Nominations for the Leadership Recognition Program are open now through March 14. The Center for Student Involvement is sponsoring this program to honor Truman students, advisors and organizations for their dedication to their peers, campus and Kirksville community through various leadership roles during the year. Nomination information can be obtained online at csi.truman.edu/lrp/. For more information on this event, contact the CSI by phone at 785.4222 or by email at csilrp@gmail.com. The Joshua Pond Law Scholarship is now available. Applicant must be a U.S. citizen or permanent legal resident, must presently have a cumulative 2.5 GPA or higher and must be currently enrolled at an accredited two- or four-year college, trade school or university. Visit joshuapondlaw.com/scholarship to find out more information. Deadline for application is Feb. 29.
AES Engineers will continue to provide $500 scholarships to high school seniors or college students, regardless of courses being studied, who meet certain criteria. Scholarships are intended for future leaders across a wide spectrum of fields of study. Students must submit an essay in answer to one of the two questions that are posted online at www.aesengineers.com/scholarships.htm. Deadline for entry is Oct. 5. Currently enrolled undergraduate college students are eligible to apply for the Foreclosure.com 2012 Scholarship Program. Students may go to www.foreclosure.com/scholarship to find out how to be entered to win one of five scholarships by writing an essay on stimulating the US housing market. Top prize is $5,000, second through fifth place will receive $1,000 each. Deadline to enter is Dec. 1. Wells Fargo is offering 40 $1,000 scholarships. Twenty will be awarded to high school students and twenty to college students through a random drawing throughout the year. Apply on line at wellsfargo.com/collegesteps for chance to win. Social Explorer provides easy access to demographic information about the United States from 1790 to present. It allows users to create interactive thematic maps using census data on a variety of subjects such as education, housing, race and religious affiliation. Visit www.socialexplorer.com for more information. The observatory will host an open house from 7-9 p.m. Feb. 21 at the University Farm. The alternate date for poor weather is Feb. 22. For more information visit observatory.truman.edu. National Recreational Sports and Fitness Day, sponsored by the Student Recreation Center, will be 12-3 p.m. Feb. 22 in the Student Union Building Hub. Free Freshens smoothie samples, massages, BMI testing and health and wellness information will be available. The Spring Global Issues Colloquium continues with “Y Ahora Aquí en el Norte” (“And Now Here in the North”) at 7 p.m. Feb. 23 in Violette Hall 1000. The Colloquium will feature Axel Fuentes, field organizer at the Center for New Community. All four of Truman State University’s large premiere music ensembles will unite for a rare joint appearance at 8 p.m. Feb. 27 in the Ophelia Parrish Performance Hall. Featured will be: the Truman Brass Choir, conducted by Gregory Jones; Cantorial, conducted by Mark Jennings; Wind Symphony, conducted by Dan Peterson; and the Symphony Orchestra, conducted by Sam McClure. The concert is free and open to the public. The American Association of University Professors (AAUP) will host its monthly meeting at 12 p.m. March 1 in Student Union Building 3201. Contact Marc Becker at marc@truman.edu or call 785.6036 for more information. The University Orchestra concert will take place at 8 p.m. March 1 in the Ophelia Parrish Performance Hall.